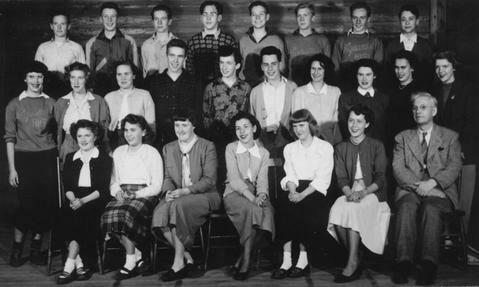 Left to right, front row: Elsie Klassen, Anne Confortin, Isabel Buchanan, Doreen Hurst, Christine Nygard, Betty Jordan, Mr. A.E. White. Middle row: Joan Bishop, Betty Carson, Del Tatlow, Jack Carson, Lex Ross, Terry Frost, Margaret Boscariol, Shirley Fowler, June Confortin, Iris Klassen. Back row: Pete Shore, Dan Munro, Bill Wray, Ed Tutin, Dave Caldwell, Norm Halvorson, Ken Lutz, Glenn Valde.